The Last Drop Distillers is releasing its first single malt Scotch whisky: The Last Drop 1967 single malt Glen Garioch. Glen Garioch is one of the oldest distilleries in Scotland, it lies cradled in the sheltered Valley of Garioch and enjoys the distinction of being Scotland's most easterly distillery. This whisky was made at the time when the Glen Garioch distilled and matured big, robust and peated whiskies for the blend market. But, unusually for that time, this whisky was stored in a bourbon-style remade hogshead cask. Over the last 47 years, it has matured into an elixir of honeyed sweetness, with a hint of apple freshness and a subtle smokiness. After the angels had taken their share, only 118 bottles could be filled from the cask, by hand unfiltered and at its natural strength of 45.46% ABV. Then one by one, each bottle was dipped in hot wax to seal its driven cork. These numbered bottles, along with The Last Drop Distillers signature 50ml miniature and handbag-sized leather bound information and tasting book, are presented in a luxurious, dark chocolate-brown leather case lined with creamy, soft suede. The Last Drop Distillers 1967 Single Malt Glen Garioch will retail at around £4,600/US$7,000. Initial UK stockists include: Fine + Rare Wines, Davidoff and The Whisky Shop. Stock is available on allocation. For trade enquiries please contact The Last Drop Distillers on T: + 44 (0) 3289 3767 Email: info@lastdropdistillers.com. The Last Drop Distillers specialise in discovering legendary, limited-edition spirits, forgotten in ancient warehouses, yet retaining their original freshness. 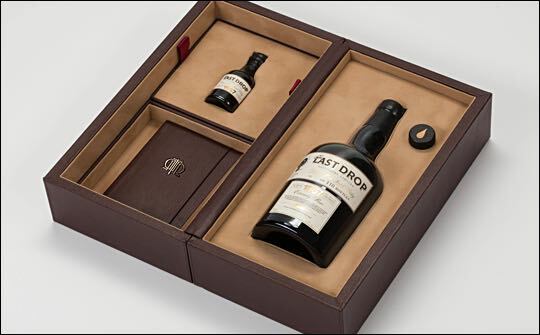 The Last Drop collection of releases includes: The 1967 Single Malt Glen Garioch, The 48 Year Old Blended Scotch Whisky, The 1960 Blended Scotch Whisky, The 50 Year Old Blended Scotch Whisky, The 1950 Cognac.